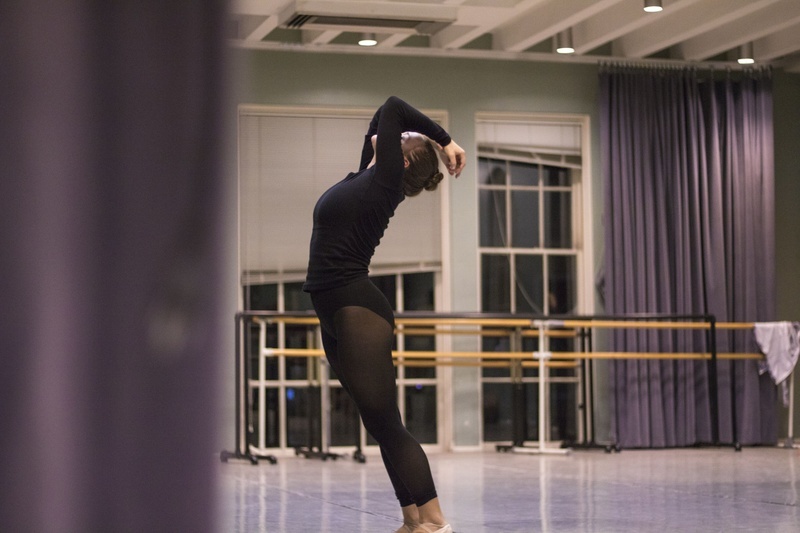 Harvard Ballet Company Co-Director Alexandra Caffrey ‘19 rehearses at the Office for the Arts Tuesday evening. The Ballet Company will showcase its production, “In Passage,” on November 3-5. It is not often that an undergraduate-run ballet company produces a full original ballet and score with live orchestra—in fact, Harvard Ballet Company believes that the debut of “In Passage” will be the first of its kind in Ivy League history. The company will perform “In Passage” at Farkas Hall, Nov. 3 to 5. Nine members of the Harvard Ballet Company choreographed a balletic representation of migration to a score composed by Sam Wu ’17. The Brattle Street Chamber Players will perform it live. Each of the ballet’s nine movements, from “Bleak Icy Winds” to “Love, Warmth, and Romance,” embodies a setting through which the dancers move. The style of ballet ranges from classical to contemporary. HBC met with Wu, who now studies at Juilliard, last spring to discuss the trajectory of the project. “He came to us with a passion for creating music and really wanted to see how to create music for dance,” said Anna K. Antongiorgi ’19, co-producer and choreographer for HBC. Over the summer, Wu composed the score at the Bowdoin International Music Festival, while HBC members tackled related projects. Laura Sky Herman ’19, Fundraiser for HBC, worked with leotard companies to coordinate the costume, a navy blue leotard with mesh paneling. Expanding on the inspiration that Wu took from bird migration patterns, the choreographers then developed a broader theme of journey. This collaboration builds on steps HBC took last year to integrate the ballet company into the Harvard arts scene. In the breakthrough production “Cityscapes” in March, HBC brought in THUD, poets, and other instrumentalists. For the first time, the company sold out the Harvard Dance Center. “We feel like dance can sometimes be a little isolated on this campus from the rest of the integrated art forms that do a lot of work together, and we wanted to bring dance and the ballet company into that more integrative space,” Alexandra Caffrey ’19, HBC co-director, said. Performing with a full original score and string orchestra is the next collaborative step, and comes with both benefits and challenges. The first and last movements, large company pieces that include 25 of the 30 dancers in the show, form another musical reprise. Caffrey and Garber choreographed them to frame the show’s theme of migration. “There are lots of group dynamics where it’s like flocks of birds actually moving around,” Garber said. The climax of the show is “The Thrill of Soaring,” choreographed by Antongiorgi. “I was thinking about what happens when we try too many things and fail. A lot of the movement is on the verge of falling,” she said. Her choreography is innovative—“not perfect classically or perfect in technique, but trying to push the ballet technique to its breaking point,” Antongiorgi said. Wu’s score was formidable for choreography. “This music is really hard to count, so I’d start by diagramming it,” Caffrey said. In addition, the dancers and musicians had to learn to speak each other’s languages. “The artistic mediums deal on different planes and have different words for different things, but once you figure out a way to creatively explain what you’re going for, it’s a really amazing experience,” Antongiorgi said. “There are so many layers, we have to decide what the audience is listening to,” Caffrey said, describing moments when the dancing brings out certain cello beats that would otherwise be hard to hear. “That’s the beauty of the collaboration,” Antongiorgi said.